Take advantage of the 4 day long weekend with family and friends and plan some weekend-long celebrations that extend beyond just cooking that one big Sunday Roast. If you’re sticking with tradition and enjoy a tasty fish supper on Good Friday then take your pick from field fare’s fine selection of fish cakes like Smoked Haddock, Mozzarella & Spring Onion or Tuna & Mozzarella; delicious ready meals like Salmon & Asparagus Gratin or Creamy Fish Pie or go upmarket with Coquilles St Jacques. Cooking up a feast for the whole family needn’t mean endless hours in the kitchen anymore, as field fare have created delicious products that cook straight from frozen, but taste home-made. Try our Yorkshire Puddings and roast potatoes – all the hard work is done for you, just pop them into the oven. And the range of pre-prepared and frozen vegetables are a quick and easy way of feeding the family without the fuss. A fabulous Easter dinner in a flash! These indulgent award-winning desserts are perfectly sized for the average sized family. High quality and hand-prepared using only the finest ingredients. Totally divine! 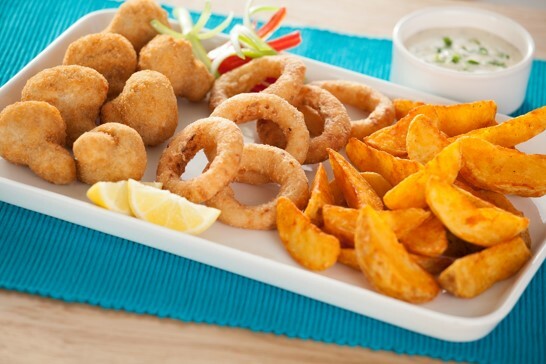 Simply entertaining and having a drinks party or buffet over the weekend, then a platter of Battered Onion Rings, Garlic Breaded Mushrooms and Spicy Potato Wedges make delicious nibbles with a dip or some sliced up Chorizo Sausage Rolls. Ideal as an alternative to meat, or on the buffet table, are these savoury veggie delights! Choose from Asparagus & Gruyere Crown, Gluten Free Roasted Vegetable Goats Cheese Pie, Mushroom Stilton Pinenut Parcel and Red Onion Sweet Chilli Goats Cheese Filo Tart. So, pop to your local farm shop today to see the fine selection of field fare products available and stock up your freezers now ready for the Easter break.